A consortium of around 10 companies is planning to build a 12,000 m² concentrating solar plant in Jaborandi, Bahia state, to the northeast of Brazil’s capital. This combined process heat and power system will use parabolic trough collectors (see photo) by Canadian-based Rackam to dry tobacco and generate electricity for an agribusiness. The relevant contracts have been signed and construction is set to start this summer. The plant is scheduled for completion in the first quarter of 2019. 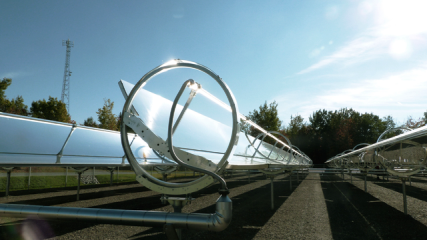 “This is a great opportunity to demonstrate concentrating solar technologies in Brazil. Moreover, the solar heat has the potential to significantly reduce biomass consumption on site,” explained Christian Dubuc, Rackam’s CTO. The heat captured by the solar field will power an organic Rankine cycle unit, which will then produce both heat and electricity, via a medium-sized turbine. The system is a demonstration project from the National Electricity Agency (ANEEL) and the sponsor companies are from the Association of Independent Electricity Producers (APINE). Its installation by the consortium, including Rackam and local partner Renoger, based in São Paulo, should broaden the country’s expertise in solar energy applications. According to a November 2017 news piece on Rackam´s website, the direct end user is the Santa-Efigenia farm in Jaborandi. It also states that utility Neoenergia has been the organisation leading the consortium. Neoenergia, partly owned by Spanish utility Iberdrola, describes itself as one of Latin America’s largest energy utilities, claiming to serve a total of 13.4 million customers. Rackam is a Canadian supplier of turnkey systems providing solar heat for industrial processes, or SHIP. Its S30 parabolic trough collector is suitable for temperatures ranging from 150 to 350 °C. Rackam is one of about 80 companies listed on the SHIP Supplier World Map by Solar Payback. According to company´s information, Rackam has completed 6 SHIP reference systems totalling 2,092 m² of collector area by the end of 2017. One of them, located at a wastewater treatment plant in the US state of Arizona, came online last summer.